​With Arsenal very much in contention for a top four finish in the Premier League and the prospect of winning silverware at the end of the season a distinct possibility, it's hard to argue that Unai Emery hasn't enjoyed a successful first campaign at the Emirates. The club have already amassed the same number of points they recorded in the entirety of last season in the league (63) while Emery has the chance to win a fourth Europa League trophy. Yet there's still an elephant in the room when discussing the Gunners - their away form. It's an issue that even the incoming Spaniard has failed to rectify, and while ​Arsenal are one of the favourites to win the Europa League, it's their away form that is set to cost them a place in Baku at the end of May, with ​Napoli in the quarter finals likely to be their stumbling block. When discussing the north London club, it's almost hard not to split them into two separate entities - Arsenal at home and Arsenal on the road. But the profound difference does lend itself to that belief. Take their ​Premier League form, for example. At the Emirates, Arsenal have won 44 of their 63 points this season (70% - third best record) with only Manchester City winning more points at their home ground in the league. Away from home, however, it's a different story. Emery's side have accumulated just 19 points, while six of their seven league defeats have come on the road. To put that into context, Leicester, Crystal Palace, Wolves and Watford all boast better away records, which is why Arsenal are only fighting for a top four finish rather than the title. FT 1-0 #efc A real missed opportunity for #afc to cement their place in the top four but Everton deserved this and really, they should have won by more. The disparity between Arsenal's home and away form is a huge problem Emery must tackle. Four of the last six are away. Add to that the fact that ​the Gunners are one of only two English football league clubs not to keep an away ​clean sheet this season, alongside Ipswich Town, and it seems clear that their defensive issues domestically will likely cost them on the continent. After breezing through the group stages of the Europa League, Arsenal struggled in both away legs of their knockout stage ties. They lost 1-0 to BATE Borisov in the round of 32 and 3-1 to Stade Rennais in the round of 16, giving limp performances in each fixture. 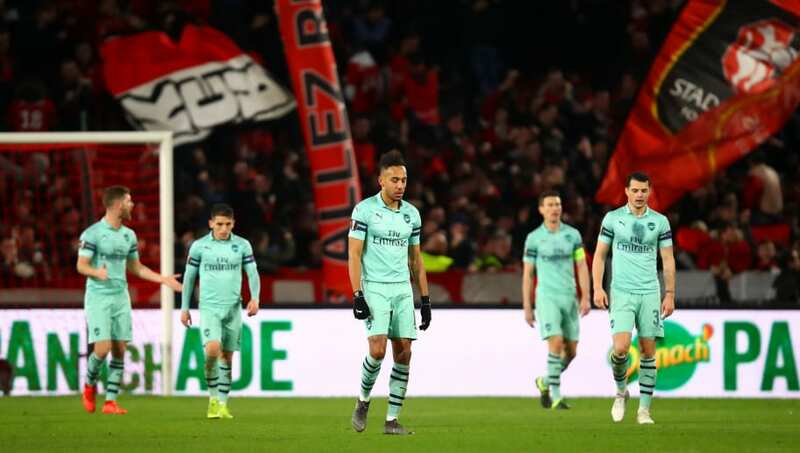 However, on both occasions Emery's side were able to rectify things at the Emirates in the return leg, winning both games 3-0. However, that's a luxury they won't be afforded when they face Napoli in the quarter finals. Along with the first leg being at the Emirates, the Naples-based club are a major step-up in quality to sides like BATE Borisov and Stade Rennais. They're currently second in Serie A behind a Juventus side that's all-but secured their eighth consecutive league title. Travelling to Stadio San Paolo is a daunting trip for most clubs, as an intimidating crowd create a hostile atmosphere that makes even some of the best teams in Europe struggle. Only Juve have beaten Napoli at San Paolo in ​Serie A this season, with I Partenopei winning 11 of their 16 league games at home, scoring 34 goals and conceding just 12. Despite falling into the Europa League after finishing third in Group C of the Champions League, they also defeated Liverpool in Italy and dominated Paris Saint-Germain in a 1-1 home draw. Even if Arsenal were to take a lead to Naples in a week's time, the likelihood of them keeping a clean sheet there is slender to say the least, with their best bet of reaching the semi finals being to score heavily at the Emirates. He's drawn level with @ECavaniOfficial in fourth place in the club's all-time scoring chart! However, the Serie A side know where the back of the net is, with their league tally of 58 goals scored bettered only by Juventus and Atalanta (both 64). The threat up front from the likes of Dries Mertens, Lorenzo Insigne and Arkadiusz Milik - who have 46 goals between them - presents a real challenge for the Arsenal defence to quell. The less said about trying to get past a defence marshalled by world class defender Kalidou Koulibaly, the better. That's why it's difficult to see Arsenal reaching the same stage of the Europa League they reached last season. For all their attacking talents, a questionable defence will see Emery's side fall short of silverware for the time being, and it's surely something that will be addressed in the summer.